X-Small - $49.99 Small - $49.99 Medium - $49.99 Large - $49.99 Only 9 left! Blu is an underdog. He's the proverbial fish out of water, living in a world that doesn't match who he is, unable to fly or live out his identity as a tropical bird. He gets made fun of by other birds, almost get smuggled, and even learns how to fall in love, all while being soundtracked by bright and happy award-winning songs about tropical paradise and being true to yourself. 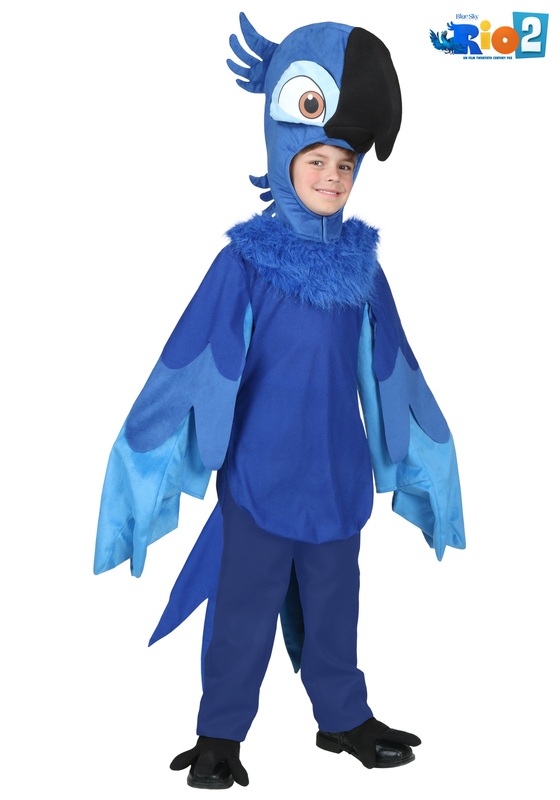 This costume is 100% polyester flannel, with faux fur and velour fabrics throughout. The shirt has a back zipper, wing-shaped sleeves with wrist slits and feather-shaped shoulder drapes. The flannel pants have an elastic waistband, the headpiece has a soft-sculpted beak, eyes, and feather tufts on top, the shoe covers have Velcro bands at the ankle, and elastic under foot. This costume also comes in toddler and adult sizes, so everyone can get in on the action!